At the Nisqually National Wildlife Refuge in Washington State there is a wonderful collection of hiking trails. Hikes of 15 minutes to four hours offer delightful exercise year around. There are opportunities for bird watching, fishing, hunting, boating, and of course, painting. Towering maple trees add color to an autumn adventure at the refuge. This 5x7 inch miniature landscape view of the Visitor's Center can be purchased from my Etsy Gallery for $50.00 plus $6.50 for shipping to US addresses. If you like to hike and stay close to nature it is worth visiting. Yesterday I took on the Different Strokes Challenge of the week and painted this 8x10 inch still life oil painting. It was an interesting value study. My usual palette is quite warm, but the reference photo led me toward a cooler range. 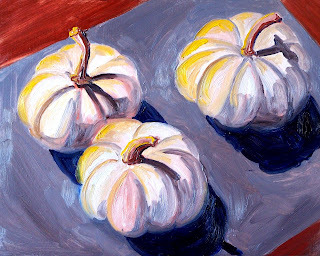 It was a stretch for me and I finally warmed the painting up with a little bit of cadmium yellow on the sunny side of the pumpkins. When I was finished, satisfaction with my results was absent. I wanted the warmth of my usual palette so badly that I cropped the original photo and painted again. The second painting is the result of my continued efforts. The drawing of the pumpkins is more precise, but the effect is completely different. I'm undecided about which painting I prefer. The second painting does not capture the mood of the original reference; artistic license is hard at work. Here's my second effort, a 6x10 inch result. What is your preference? If you visit the Different Strokes Blog, you can discover which one I finally enetered as the challenge painting. For quite a while now, I've been working almost exclusively on landscapes, but today I'm going to take on a still life for a change. In celebration of a change, I've listed this small 5x7 inch still life oil painting that I created last year in my Etsy Gallery. I've been attached to this little one and was reluctant to let go of it, but the time has come to part. Closeups and purchase information for this small format art are available in the Etsy listing. 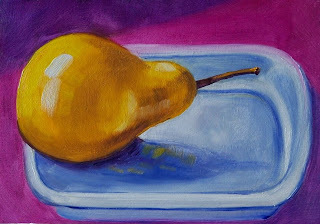 You can also view other small format still life paintings in my Etsy Gallery. This morning I painted something out of the ordinary for me--a figurative painting. It's quite simple, but reflects a dream that I have to paint figures well. Occasionally I putter with painting figures, but usually don't share my results. Like all things done well, it takes practice. If time and money were no problem, I'd make a straight line to the Gage Academy of Art in Seattle and get some really top-notch instruction on drawing and painting figures. Until then--only in my dreams. This miniature oil painting is 5x7 inches on a gessoed hardboard panel. 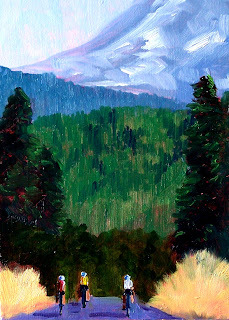 This little 5x7 inch oil painting was inspired by a recent trip to Mount Rainier in Washington State. The Mountain, as it is often called by locals, is a dormant volcano in the Cascade Mountain Range. It towers over Western Washington State at over 14,400 vertical feet. The most amazing discovery of my trip was that people bike up the mountain . There is an annual ride called the RAMROD (Ride around the Mountain in One Day) that includes a climb of 10,000 feet sponsored by the Redmond Cycling Club. The trek is uphill most of that time with constant switchbacks in the road which lengthens the distance a rider must pedal in order to accomplish the feat. The folks that take this ride are atheletes of the sturdiest kind. This painting which commemorates these amazing atheletes recently sold at my Etsy Gallery where more miniature landscape paintings are on display. This painting is one of a series I completed this past summer. The others were all much larger paintings, so this 5x7 inch painting is a little bit different just because of its size. 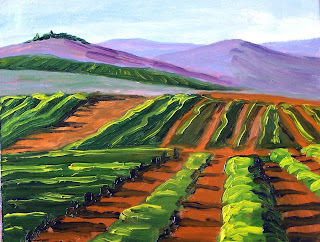 What inspired the series was the brilliance of summer folliage and the warmth of the fields. As I painted, I imagined the comfort a summer breeze and the warmth of summer sunshine. As we enter into the fall season, days such as the one depicted in this painting are a gentle memory. The largest painting of this series was 24x30 inches. Detailed thumbnails of this miniature painting can be viewed in my Etsy gallery. A few months ago I participated in a landscape challenge in an online forum. There were several reference photos from which participants could select. Each photo contained some type of challenge for a visual artist. I selected a photo of a marsh which contained not only a foggy atmosphere, but a reflection--an unusual combination. Both fog and reflection provide some interesting problems for an artist to solve. My palette usually has a predominantly warm focus, so the cool nature of this painting was also a switch from my usual color selection. This little 5x7 inch miniature oil painting is the result of my efforts. 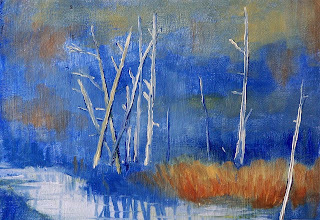 To see more paintings with both a warm and cool palette visit my Etsy Gallery. Dropping the horizon line low on the picture plane creates an emphasis on the sky. 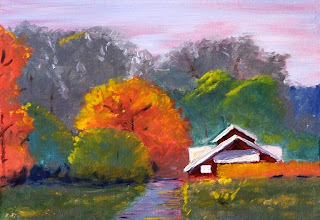 When I painted this miniature 5x7 inch oil painting, this was my goal. The barns and other vegetation seem insignificant in the vastness of the sky and clouds. When standing in an open field, I often feel dwarfed by the air around me. 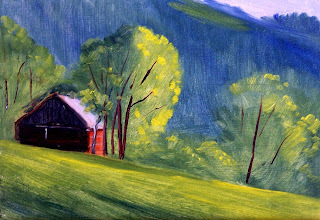 Clickable thumbnails allow viewers to see the texture of the grass and the brush strokes that rendered the barn, trees, and sky. 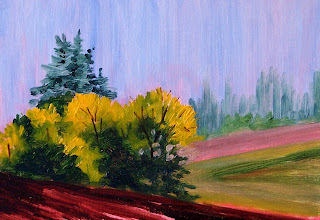 Other miniature landscape paintings are available in my Etsy gallery and in my Flickr Photostream. Here is another of my little 5x7 inch miniature oil paintings. This one was created with the dampness and color of autumn in mind. Fog and drizzle is the name of the game in the Pacific Northwest. Just as the colors begin to turn, the rain sets in and soaks the landscape. Painting these little gems is a wonderful weekend pass time. I have filled my portfolio with these miniature landscapes. My Flickr collection is where I store them until it is time to let go and move them into a new home. Today was a wonderful day for painting. Outside the rain is coming down in a slow autumn drizzle which gives my studio nice even lighting. On sunny days, I'm limited to painting in the morning because the afternoon light is too intense and the resulting glare makes it difficult to work. With the overcast lighting, I worked longer than usual. It felt really great! 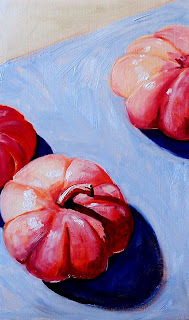 This little painting is 5x7 inches and is one of several small paintings I was able to produce. Working small is one of my favorite activities, but I'm getting the itch to paint something larger. Today was an especially exciting day. Several of my 8x10 tree oil paintings were delivered to a Seattle gallery in Pioneer Square, Northwest Fine Woodworking. The paintings are framed with beautiful mahogany frames and will be displayed very soon. If you are visiting Pioneer Square, stop by the gallery and ask to see my work. As many of you probably know, the landscapes of Montana are one of my favorite subjects. 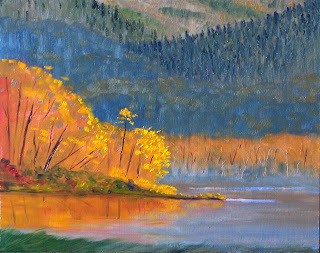 The vistas include beautiful meadows, forests, and mountains--all subjects I enjoy painting. I long to visit the state again to gather in more beauty and paint more. My Etsy Gallery contains other small 5x7 inch landscape oil paintings as well as some of my other favorite subjects. 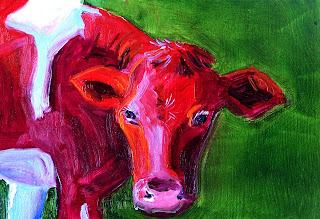 Here she is--the third of my recent cow paintings--red cow on a field of green. This young lady is curious, but weary, like she is uncertain about the world at which she is peering. 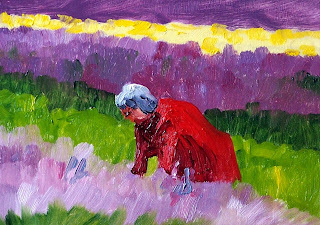 This painting like the last two, is a small 5x7 inch oil painting. Brush strokes and texture are easier to see in closeups. Oil paint is a great medium for creating special textural effects. 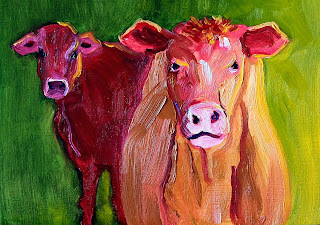 As promised, here is another of my little 5x7 inch cow paintings. These young ladies were created using professional grade oil paints on a gessoed hardboard surface. When I painted them, I used loose brushwork and thick paint. Closeups of the impasto can be found in the thumbnails at my Etsy Gallery Shop. Visit the gallery and click on the thumbnails for a larger view and information about purchasing this painting and others in this series. Painting cows is just plain fun. They have very expressive faces and their angled shapes are a joy to paint. 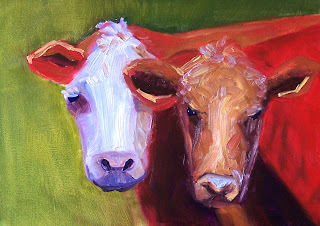 I've added this 5x7 inch pair to my Etsy Gallery and will be adding other miniature cow portraits over the next few days. Closeups demonstrate the heavy texture of the paint I used when creating this duo. It can't be denied. Fall is opening the door. The trees are turning. Science Made Simple provides a good explanation of the phenomenon of the changing leaves. Today's 8x10 inch oil painting takes its inspiration from this phenomenon. A gallery of closeups will allow you to see some of the impasto that characterizes this painting and learn more about the materials I used. 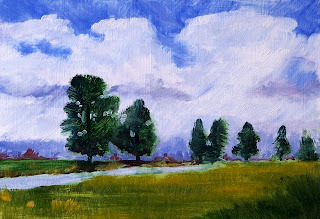 Point Defiance Park in Pierce County of Washington State provided the inspiration for this 5x7 inch miniature oil painting. There is a natural Rhododendron garden that boasts numerous examples of the plants which also carry the designation of the Washington State flower. 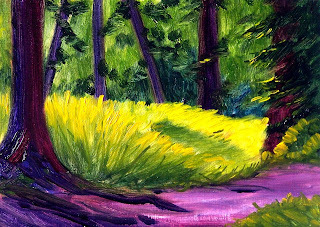 Although this little painting does not include any of the lovely Rhododendron blossoms, it does reflect the brightness of the sunlight that sifts through the fir trees and highlights the natural vegetation. Closeups of the brushwork are available at my Etsy Gallery along with purchase information. 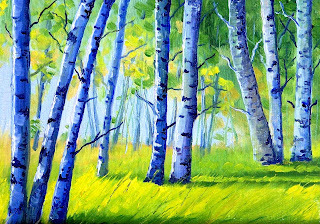 The painting of Birch trees is an activity I enjoy from time to time. Their light bark in contrast with the dark limbs and blemishes is fun to recreate. It is a delightful challenge to determine the range of colors which can help develop the illusion of Birch trees. 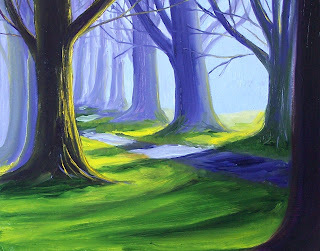 In this particular painting, I used Ultramarine Blue to develop the shadows and darker elements of the trees. Yellow grass and leaves combine well with the blue to create a wonderful, summery green. 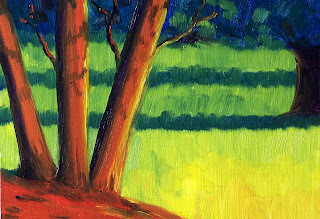 Clicking on this closeup link provides several clickable thumbnails of this little 5x7 inch landscape oil painting. The same link provides information on purchase of this miniature oil painting. 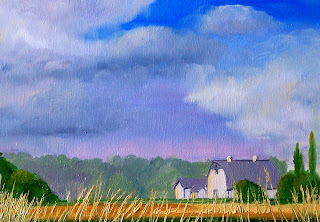 Viewers may also be interested in additional landscape paintings available at my Etsy Shop. Today's 5x7 inch oil painting is one of my favorite creations. I really like the contrast of the red, the green, and the warmth of summer foliage. 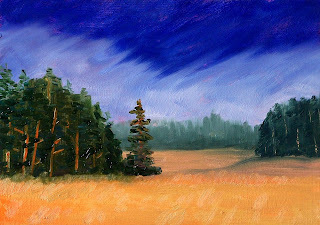 This little landscape was painted last spring; I enjoyed it throughout the summer, but it time to let it go. It is now available for purchase by clicking here. Shipping to US addresses of $6.50 plus $50.00 for the painting can transfer this little painting to your ownership. Walking in the woods on an autumn day will soon be looking like this 8x10 inch oil painting which I created this weekend. The colors of fall are beginning to peep through the green. I want to relish the summer green that still lingers because it will be gone soon. Today's painting is another in the Montana series. The golden fields, the groves of pine, and the always distant mountains create a fabulous environment. 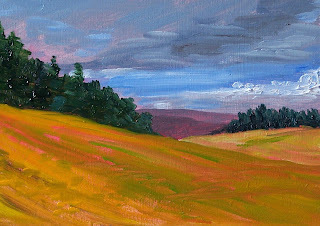 This particular 5x7 inch oil painting developed as I considered gathering storm clouds drifting across the colorful landscape. This 8x10 inch painting was created last spring just as the crops emerged and the warmth of the sun encouraged them further. It is a painting that is characterized by loose brush strokes and juicy oil paint. Looking closely, the texture becomes more apparent. You can click here to see some closeups. 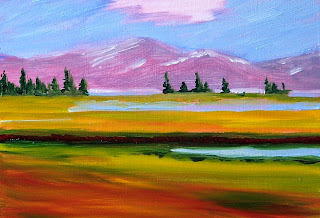 This 5x7 inch oil painting is another from my Montana series. 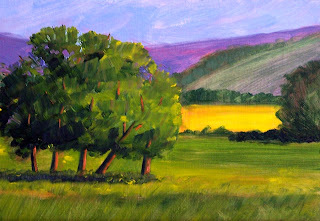 My memories of the beautiful meadows, mountains, trees, and lakes prompted this landscape. The landscape of Montana will be covered with snow within a few months. Summer hikers will be replaced by snowmobiles and snowshoers. Montana is a country for sportsmen. 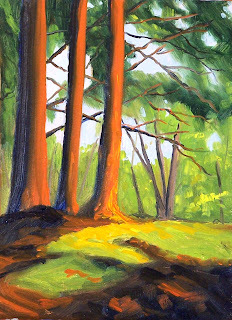 Today's 5x7 inch tree portrait is from an exercise I completed a while ago using only a limited palette. 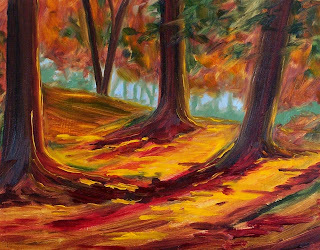 Three professional grade oil colors were used--Cadmium Lemon Yellow, Alizarin Crimson, and Ultramarine Blue. It is fun to mix colors and come up with a wider variety of hues even though the palette is small. Closeups and purchase information for this painting can be found here. The Labor Day weekend usually signifies the end of summer. With the weather still warm, it is also a good time to take a hike in the wilderness of the Pacific Northwest. Today's little 5x7 inch oil painting gathers inspiration from the Hoh Rainforest in Northwest Washington. Lots of moss hangs from the trees, the climate is temperate and moist. If you have not decided how to spend your day, consider a a forest hike. If a forest hike sounds like a good idea, but your motivation isn't quite what it needs to be, you can purchase this little piece of nature for $50.00 plus $6.50 shipping to US addresses by clicking on this link.